1. Preheat the oven to 180ºC, gas mark 4. Mix together the crushed cookies and butter, stirring until evenly mixed. Tip the crumb mixture into a deep, 23cm, non-stick cake tin, pressing the crumbs down firmly with the back of a spoon. Place in the fridge for 5 minutes. 2. Place the soft cheese, cream, sugar and cornflour in a large bowl and beat with an electric whisk until smooth. Add the Baileys and eggs and whisk briefly until blended. Pour into the prepared tin and place on a baking sheet. Scatter over the white chocolate and cook for 45 minutes until dark golden - it might still be a little wobbly in the centre but will set as it cools. 3. 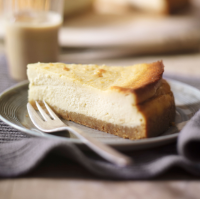 Turn off the oven, open the door and leave the cheesecake to cool completely. Chill, preferably overnight, until ready to serve.